We are in the process of harvesting our largest crop ever and the garlic looks terrific! These beauties are our Red Grain garlic, a purple stripe garlic. Harvesting garlic usually takes place in July or August, depending on your location. Harvesting the garlic too early will result in smaller heads, harvesting too late will result in overly mature garlic that will not store well. One indicator that the garlic is ready for harvest is when the lower half of the leaves turn yellow and brown. You can always pull a few heads to decide if it’s time. If the head is good sized and the cloves fill the skin it is ready for harvest. Harvest the garlic head, with the plant attached, using a shovel. Garlic can bruise, so handle carefully. Clean off excess soil and bundle in groups of five to ten plants. Hang them in a warm, dry, airy place, out of the sun, for 3 to 4 weeks to cure. If you live in a very humid climate, you may want to remove the stems and roots and place the bulbs on a screen or chicken wire rack, for the drying/curing process. 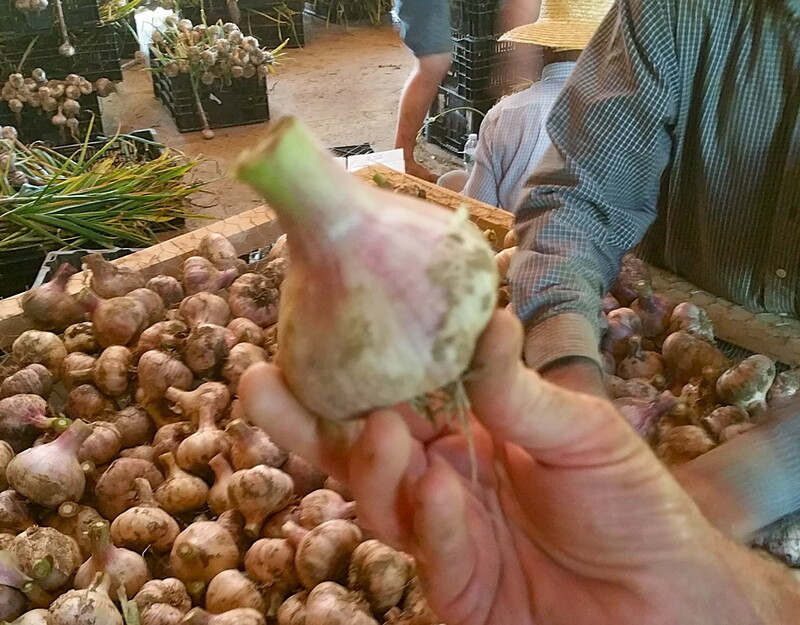 After curing (check the clove wrappers inside the bulb to make sure they are dry) trim the stem and the roots and store in a cool (50-55 degrees), dry place for the fall and winter months. We are in the process of harvesting our largest crop ever and the garlic looks terrific! If you would like to order more garlic to plant this fall please order soon while selections are still good. Perhaps you would like to try some new varieties? Our new varieties – Red Grain, Italian Red and Hungarian Red are amazing – large, beautiful bulbs. Click here to Order your garlic now!